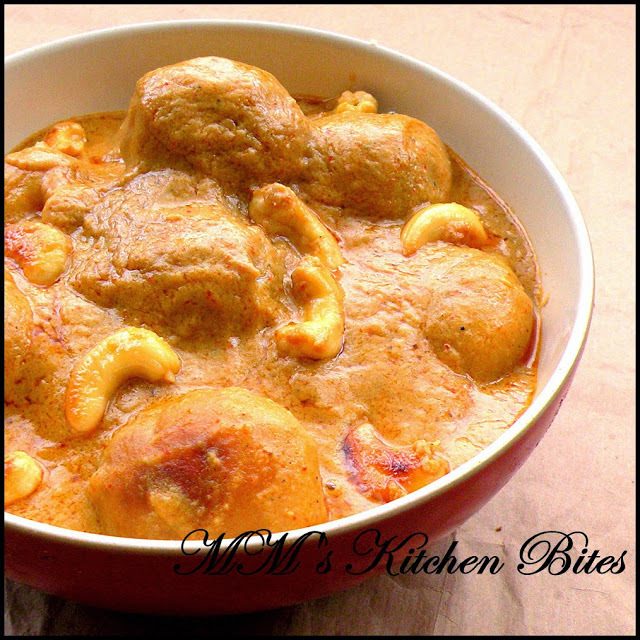 Home cashews Shahi Dum Aloo (Potatoes cooked in cashew nut gravy)…the prodigal blogger returns!!! Shahi Dum Aloo (Potatoes cooked in cashew nut gravy)…strange how potatoes have become my go-to ingredient (I still refuse to call it a vegetable!!) over the years, instead of the vitriolic hatred I felt for them earlier…the array of potato dishes that I can churn out now amazes me as well at times – Indian, Indian inspired, non-Indian…as long as there are potatoes at home, the man isn’t going hungry…he will go fat but not hungry J…there are six variants of dum aloo that I can do now and this is but only one of them…the humble yogurt replaces the cream that is typically used and believe me, makes this one better than the original Shahi. Soak the posto and cashews in ¼ cup of warm water for about 15-20 minutes. Grind into a very fine paste. Whip the yogurt very well with a fork and keep it on the kitchen counter to ensure it is at room temperature before you start cooking. Peel the onion. Boil it in ½ cup of water till it becomes soft and all the water evaporates. (Or pressure cook in ¼ cup water for two whistles on high). Let cool and grind it into a fine paste. Heat 1 tbsp oil/ghee in a heavy bottom pan (with lid). Lightly fry the potatoes till pale golden brown on all sides. Remove the potatoes using a slotted spoon and keep aside. If using cashews for garnishing later, fry them in the same pan on low heat till pale golden on both sides. Lower the heat and in the same pan, add the balance 1 tbsp oil/ghee. Splutter in the cardamoms, cloves, cinnamon and bay leaf. Add the onion paste and sauté for 15-20 seconds till it starts to change colour. Add in the ginger paste, mix and sauté together for a minute or two. Add in the turmeric, red chili powder, kashmiri chili powder, coriander powder and salt. Mix well with the onion paste and let sauté for a minute or so. 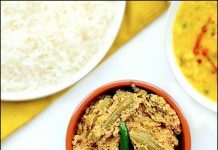 Add in the posto and cashew paste, mix and let it all fry on low heat till the masala starts releasing oil at the sides. Now add in the potatoes and toss them around to ensure they are well coated with the masala. Let the potatoes cook till the masala starts oozing oil again, about 10 minutes. Do stir frequently but gently – don’t let the cashew paste burn or let the potatoes break. Switch of the heat and let the potatoes cool a bit. We need to add the whipped yogurt now and if the potatoes mix is too hot, the yogurt will split. Add the whipped yogurt, mix well and switch the heat back on again – at the lowest heat and let the mix cook for a couple of minutes. Check for salt and add more if needed. Add this stage, add ½ a cup of water and cover with a lid and let the potatoes simmer for 10-15 minutes till you get a thick gravy and oil starts releasing at the sides. Sprinkle fennel seed powder and mix well couple of minutes before switching off the heat. 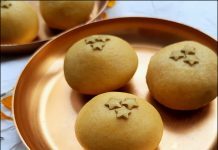 Top with fried cashews and serve hot with plain pooris or paranthas. 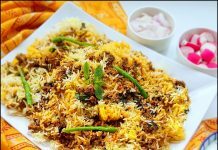 Previous articleJhatpat Meethi Sevviyan (Quick Fix Sweet Vermicelli)…never stop at one!! Next articleMutton Korma…cheat your way out!! Looks fabulous. Potatoes in a delicious sauce are always a favourite of mine.